On the 16 th May 2015, Apulia Region Civil Protection presented Hazadr publication to the XXIX International Book Exhibition 2016 in Torino. The Apulia Region was the special guest of the International Book Exhibition 2016. Its large exhibition space, in Hall 3, was designed to let the visitor in a fairytale path, allowing to stop and read, to browse through the libraries of Apulia publishers, to buy, to experience the different audiovisual experience in an atmosphere full of emotion. It has also gathered the most prestigious institutional presence. Thirty-seven Apulian publishers were present and over eighty events scheduled in the exhibition space including the presentation of the publication of the project Hazadr. 30.09.2015 - Take a look to Hazadr results! The Hazadr Final Publication is now available! Collecting useful contributions by project partners, the final publication offers an overview on a cross-border initiative to protect the adriatic coasts from the oil spill and the results of the Hazadr project and new perspectives. Available into YouTube channel the Video-documentary realized during the project and presented at the final conference In Rijeka on 30th September 2015. Kick off at 03:00 p.m. at the Adriatic Training and Research Centre. 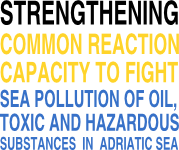 On 29th of September in Rijeka, the County of Primorje and Gorski Kotar promotes the Hazadr Final Conference and presents the official opening of ATARC - Adriatic Training and Research Centre. On the 23th-24th September 2015, the leader partner Apulia Region, the partners Emilia Romagna Region and Marche Region organize the second Hazadr local workshop in Ferrara at CoastEsonda Expo at Ferrara Exhibition Center. CoastEsonda Expo, the event on coastal zone and sea management and protection, hydrogeological instability and endangered territory maintenance, brings together the most competitive companies, universities, research, associations and the main institutions of the sector, including Port Authorities, River Basin Districts, Reclamation Consortia, Regions and ARPA. The Institute of Marine Biology organized the second local workshop in Kotor on 22th of September 2015 named “The transfer of knowledge gained in professional courses POSOW and IMO - Adriatic Training and Research Centre for Response to Accidental Marine Pollution ATRAC”). The final results of the project HAZADR were presented among the stakeholders. On the 9th of September, Region of Istria organized handover of specialized equipment for fighting accidental marine pollution. This handover was made possible by reallocation of the project resources, along with the resources left from the first procurement. 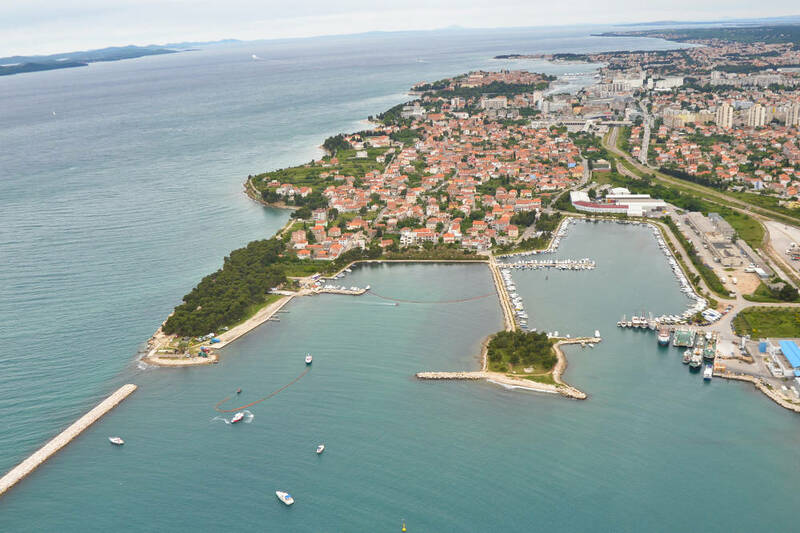 Altogether, it was enough for five regional port authorities (Umag – Novigrad, Poreč, Rovinj, Pula and Rabac) and National park Brijuni to acquisit new equipment which is going to help them protect Adriatic Sea in case of accidental marine pollution. Equipment bought and distributed in this procurement is backpack mist blower, firefighting hose with trolley reel, oil containment and absorbing booms, working suits and protective respiratory masks, troilboom repair kit, oil absorbing pads, floating absorbent, dispersant, eco sets and recycling eco sets. Regional representatives were present during the distribution of equipment. Contracts and agreements concerning handover, storage and use of the equipment were signed with all the parties. With implementation of this handover, Region of Istria concluded all of the planned activities concerning project HAZADR. Find out about the latest HAZADR news in this issue of the international newsletter! The Atlas system became fully operational! The first real warning came into the system last week. A livestock carrier crossed the sea near the Puglia Region showing a red Coma dex index. This produced a warning message and an email. The Civil Protection of the Puglia Region made a request for a simulation to the Marche Region, filling a specific format on the Hazadr web site, to understand the direction of the oil spill in case of an accident. The Marche Region quickly provided the simulation of the oil spill on the Atlas system and a video of the spill. Luckily it was possible to see that in the case of accident the spill wouldn’t reach the coast. The Civil Protection of the Puglia Region continued to monitor the situation till the ship crossed the Adriatic sea and received the signal of end-alert. It was an opportunity to test the Atlas system, developed by the National Research Council in Bari in collaboration with the Emilia Romagna and Marche Region and the whole alert system developed during the Hazadr project. Italian partners of Hazadr project organized a meeting between the Civil Protection of Apulia Region, National Research Council in Bari, Emilia Romagna Region, Marche Region, The National Department of Civil Protection, C.O.E.M.M. - Centro Operativo Emergenze e Marittime and the Comando Generale delle Capitanerie di Porto. The meeting was organized at the Comando Generale delle Capitanerie di Porto in Roma on the 21th July 2015. It was an opportunity to show and promote the potential of the Atlas and alert system, developed by the National Research Council in Bari in collaboration with the Emilia Romagna and Marche Region, partners of the Hazadr project and to suggest future cooperation. The sixth and last steering committee meeting was organised and held in Pula (Region of Istria). Representatives of all partner institutions gathered and discussed about project activities which are still to be implemented and further capitalisation of the project results. Main focus was given Adriatic training and research Center established by Primorsko goranska county and future usage of the ATLAS. After completing of all project tasks, all project results will be presented during final conference scheduled for 29th September 2015 in Rijeka. Adriatic Training and Research Centre together with other partners had organized POSOW training courses and IMO OPRC Level 1 courses. After the first local workshop in Split-Dalmatia County on the use and conservation of ocean type of booms that are procured under the project HAZADR, second local workshop on "The sudden oil pollution of the sea" was held on 15th and 16th June. Lectures were given by prof. Damir Zec from the Faculty of Maritime Studies of the University of Rijeka, dipl.ing. Matko Basic from the company CIAN and prof. Mladineo from the Faculty of Engineering of the University of Split. The two-day training has sparked great interest and was attended by representatives of the Firefighting brigades Kastel Gomilica, NPRD, Brodosplit, Port Authority of Split, CIAN, Coast Guard and many other entities involved in the system of supervision, cleaning or monitoring of sea pollution. From the 26th to the 28th May 2015, Civil Protection Service of Apulia Region presented Hazadr project to the Forum Pa, at Palazzo dei Congressi, R oma. Forum Pa was born in 1990 as a simple exhibition. During the years, Forum Pa changed its role and today the exhibition is a real moment for debate and meeting that lasts all year. It is the main occasion for all professional communities and all innovation actors, belonging to Forum Pa networks, to meet. Today Forum Pa is not just a showcase for the best experiences, sometimes too much isolated, but it represents an important observatory on changes, an integrated public communication project, a place where it’s possible to aggregate processes and innovative networks that, beginning from the exhibition, spread on web and territory. In the framework of the IPA Adriatic Project "HAZADR" on May 15, 2015 was held the joint exercise PAM-EX 2015 with the participation of three countries in the region, Italy, Albania and Montenegro. The exercise was conducted in two directions: response operation at sea and ashore. The exercise PAMEX in the Southern Adriatic, organized by the Civil Protection Service of the Puglia Region, leader of the European project IPA Adriatic HAZADR, was presented at the Palace of the Brindisi Province on 11th May 2015 at 15:00 p.m. The exercise was done on the morning of 12th May 2015 on a strip of the beach in the Apani area (Brindisi), on the southern border of the Natural Reserve of Torre Guaceto. The activities involved in particular the local authorities which have territorial jurisdiction and the Volunteers of Civil Protection teams, all together in a simulation of intervention derived from oil spill reaching the coast of the Municipality of Brindisi. 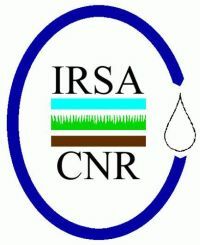 The aim of this is exercise is to demonstrate the effective achievement of the main objective of the project HAZADR: the creation of a cross-border network for the prevention of risk and emergency management, with the strengthening of a common reaction capacity of the nation facing to the Adriatic Region against environmental and technological risks arising from collisions, wrecks and accidental releases of oil or toxic material at sea. All this in order to reduce the risk of pollution and contamination of the Adriatic Sea, which plays an important role in the tourism and industry and it is one of the Mediterranean areas most exposed to the risk of pollution and accident at sea. The first local workshop dedicated to local experts and staff involved in oil spill response was organized from Apulia Region, Leader partner of Hazadr project, in Brindisi on 7th of May 2015. The purpose of the workshop was presentation of the project and results achieved within the project with emphasis on work package 4., "Improving the level of equipment and Cross-border response preparedness in case of accidental marine pollution". The Institute of Marine Biology organized the first local workshop in Kotor on 5th of May “Promotion of international exercises in cases of oil spills in the sea”. The main project results and future plans were presented among the stakeholders. The participants were introduced with the past two exercises organized in Croatia and Italy, VIREX and ERCOLE. The main part of the workshop was devoted to the promotion of the following cross border exercise PAM-EX, that will be organized in Italy and Albania from 11th to 15th of May 2015. The University of Montenegro organized an important workshop on the 25.03.2015 which aimed at promoting international projects at the University of Montenegro. Representatives of the faculties presented their projects in the field of natural, technical, medical and social sciences, presenting the objectives and results of the projects as well as experiences and challenges implemented under the different programs offered by the European Union, such as IPA, Tempus, FP7 and others. HAZADR was presented as one of the most important in the field of Adriatic environmental protection. 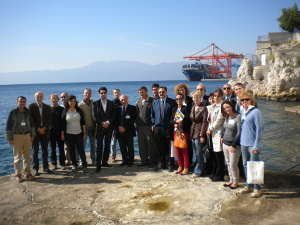 County of Primorje and Gorski Kotar organized a national local workshop in Rijeka at 10th march 2015 to present ATRAC - Adriatic Training and Research Centre for Accidental Marine Pollution at sea. County prefect Mr. Zlatko Komadina explained the importance of establishing the regional canters of expertise which can provide training and expert advice on all matters related to preparedness for, response to and cooperation in case of marine pollution at sea. The Centre is conceived as an organization (legal entity) which will act in the area of all Adriatic states in the field of preparedness and response of the institutions and interest groups involved in national or regional mechanisms of intervention at sea. The director of ATRAC through a power point presentation pointed out the vision, goals, activities, content of educational activities and other key settings of the working scope of the Centre. On Tuesday 24th of February, prefect of Split-Dalmatia County Mr. Zlatko Zevrnja handed over to Firefighting brigade Kastel Gomilica specialised equipment for interventions in case of accidental marine pollution. Split-Dalmatia County is organizing first local workshop on 24th of February covering topic of usage of ocean type of booms procured through HAZADR project. On that occasion it will be celebrated World Civil Defence Day. A setup of the first HF radar on the Slovenian coast is an achievement of the HAZADR project. Second workshop for local experts was organised by Region of Istria on 14th and 15th of January 2015 in Pula. Participants of the workshop were members and deputies of Regional Operational Center of Region of Istria, representatives of five regional port authorities and employees of private company Dezinsekcija d.o.o. The fifth Steering Committee meeting of HAZADR project was organized on 9th and 10th of December 2014 in Tirana (Albania). After the welcome speech of the political delegates, the Apulia Region introduced the state of the art of HAZADR and the agenda of the meeting. As a part of WP 4 , Marche Region and Emilia-Romagna Civil Protection have organized an exercise called ERCOLE (Emergency Resp onse to Coastal Oil spill Exercise). The aim of the exercise was to test the capacity of response on coastal areas after an oil spill happened in central Adriatic, opposite to Marche Region. The exercise began with in a dispatch received from ACCRA Adriatic Coast Control Room Ancona: on 23rd September (approximate time 06:00 pm) “a relatively large quantity of crude oil is leaked into the sea”. First local workshop dedicated to local experts and staff involved in oil spill response was organised in Port of Pula on 29th and 30th of July 2014. The purpose of the workshop was presentation of the project and results achieved within the project with emphasis on work package 4., "Improving the level of equipment and Cross-border response preparedness in case of accidental marine pollution". The Fourth Steering Committee meeting of HAZADR project was organized on the 3rd and 4th July 2014 in Zadar (HR). The partnership focused on the lesson learnt after the first HAZADR exercise called Virex 2014, the presentation of the preliminary scenario of the crossborder exercise 2 in Emilia-Romagna Region – Marche Region and the creation of a warning dispatching system for the Adriatic coastal areas. 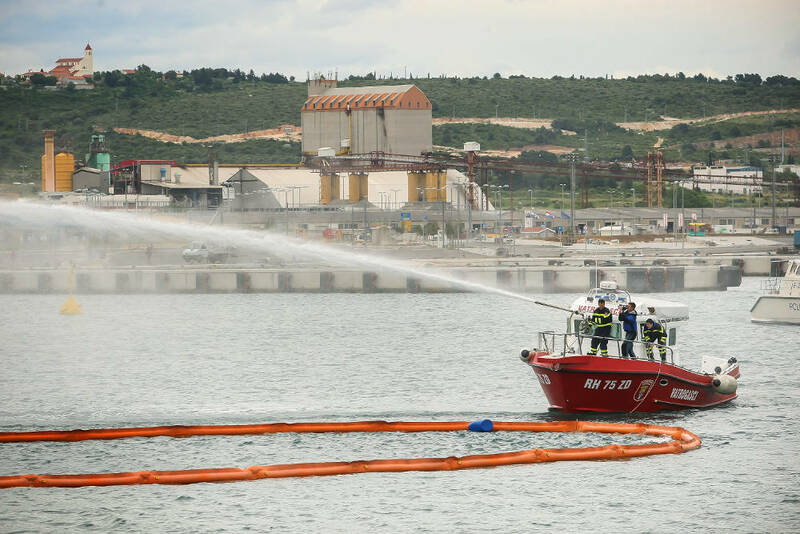 Oil spill response exercise in Northen Adriatic called Virex 2014, the first cross-border exercise held during the implementation of project HAZADR, was successfully completed on 16th May 2014, after three-days activities. Active participants to the exercise were members of County's Operational Centres (COC) from Zadar, Primorje-Gorski Kotar, Split- Dalmatia and Šibenik-Knin County, members of the Maritime Rescue Coordination Centre from Rijeka (MRCC Rijeka), the national Headquarters for the implementation of the Contingency Plan of Republic of Croatia, Croatian Coast Guard and project HAZADR partners from Regia Puglia, Regia Marche, Albania and Slovenia. 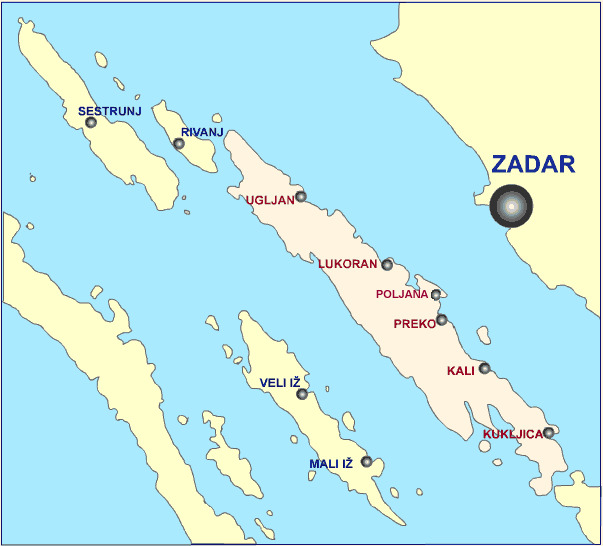 Also, the exercise also included active participation of companies specialized for interventions in case of marine pollution and marine environment from Primorje - Gorski Kotar, Zadar, Šibenik - Knin and Split - Dalmatia County, and public institutions and services from Zadar County's area, which are responsible to participate in case of pollution. 05.05.2014 – HAZADR organizes an OSR exercise "HAZADR Virex 2014"
Between the 14th and 16th of May 2014, the County of Zadar organizes the first HAZADR exercise to fight oil pollution. The exercise will be held in the waters of the island of Ugljan (shoals Sajda) and the coastal area in Zaton. The implementation of the join exercise will show the level of preparedness and the teamwork of all the bodies responsible for monitoring and protecting the sea and coast from pollution. Based on identified potential deficiencies in the organization and implementation of interventions, guidelines and recommendations for improving the overall system and the Contingency Plan will be produced. 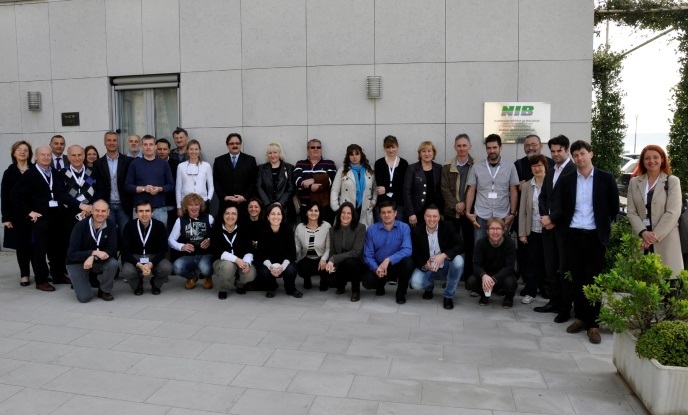 The Third Steering Committee meeting was organized in Piran on 20-21 March 2014 at the premises of the Marine Biology Station. During the meeting, the consortium assessed the overall project performance and discussed important issues like the finalization of the ATLAS, the vulnerability maps and the new scenarios for the exercises. 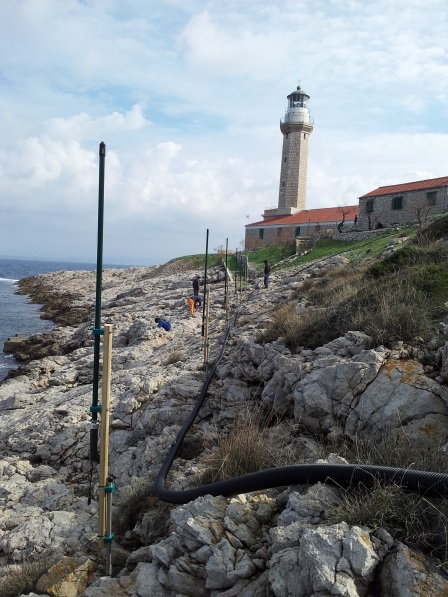 The installation of two HF Radars by the Institute of Oceanographic and Fisheries in the Lighthouse Razanj (island of Brac) and Lighthouse Stoncica (island of Vis) is now a reality! The operational mode of the HF radars are the following: (1) data download from instruments to on-site computer; (2) data transmission to the MEDAS database in Institute via wireless GPRS connection; (3) data validation (IOC, EMODNET procedures), processing and calculation of currents speed, direction and waves. The HF radars resolution is: Spatial - grid cells 1*1 km; Time - interval 30 minutes. The presentation of output data in „real time” can be found here. The installation of the radars in the islands of Brac and Vis is part of the improvement of the radar systems in high trafficked areas of the Adriatic sea, that represents an important asset of HAZADR project, since they integrate the ATLAS forecast tools. OGF (IT) and NIB (SI) are finalizing the installation of others 2 WERA HF radar systems each, covering the Gulf of Trieste, that will be ready by the summer 2014. On the 4th of November Mr Marco Meggiolaro, project manager on behalf of Apulia Region and Mr Michele Vurro, CNR, scientific coordinator and developer of the ATLAS, were in Athens to take part in a meeting with the MEDESS-4MS board, a MED project which is developing an oil spill forecasting system for the whole Mediterranean. After the presentation of the HAZADR architecture, a positive discussion took place over some possible synergies between the two projects. The MEDESS-4MS board and HAZADR agreed to gather the data requested by the CNR from the Adriatic regions and come together one again in January 2014 to discuss a Memorandum of Understanding to exchange the necessary data to upgrade both web-tools. Apulia Region Civil Protection dept. and the Ministry of Public Works and Transports of Albania took part as observer at the exercise named Pollex 2013, organized in the Adriatic sea in front of Ancona on the 22nd of October 2013. The study visit, useful to prepare the oil spill simulation foreseen by HAZADR in 2014, consisted in the technical view to the Integrated Control Room of the Province of Ancona, the technical view to the Municipal Operations Center of Falconara Marittima, to the shoreline of Falconara Marittima - Villanuova beach and – finally – to the monitoring coast Site of Ancona Gulf placed in Fornetto and Coastal Control room of Marche region. The County of Primorsko Goranska hosted in Rijeka (Croatia) the second meeting of the Steering Committee. After the welcome speech of the political delegates, the Apulia Region introduced the state of the art of HAZADR and the objective of the meeting. The discussion focused on the development of the Real Time Risk Prevention System (ATLAS). COAST EXPO is the most specialized event in Italy dedicated to coastal zone management and protection. In its 2013 fourth edition, it represents a meeting point and a forum for public administrations, research institutions, universities, engineering companies and consultants, professionals, organizations, operators, at national and international level. Under the coordination of Emilia-Romagna region, a special session for HAZADR has been organized during the exposition on 20th September 2013.